13/11/18, Copperhead is now on the Ramtops map, shop contents to follow. 29/05/17, I have finally added the souvenir shop at the Least gate in AM and the Arcane Transport departure locations. Fingers crossed the next update will not be so delayed. 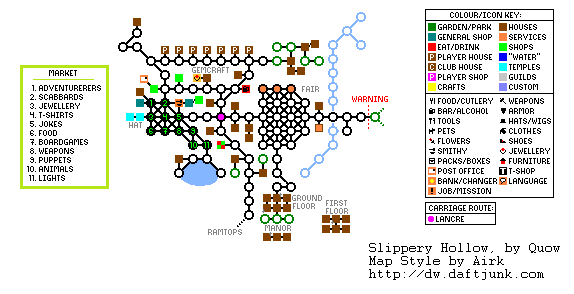 26/11/16, Thanks to Quow for sharing his map of Slippery Hollow. Shops, NPC's and their items are being added to the database as and when I get time. Found an error or something not on the map? Please contact Avicenna with the details.